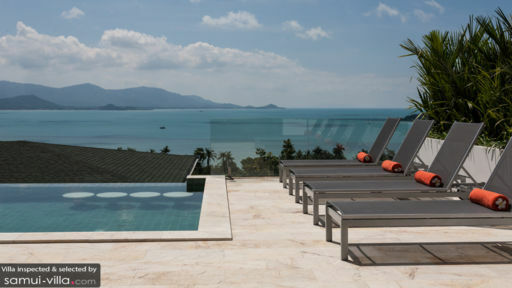 Nestled merely 300 metres away from Samrong Bay beach and offering views of both Koh Som and Koh Phangan, Villa Daizo is a modern home with contemporary trimmings set facing the most mesmerising view of turquoise water. The villa features three bedrooms and a vast sun deck for basking under the tropical sunshine. You will find everything to your liking from the spacious living areas, modern conveniences, and spectacular sunsets over the horizon. Perfect for families looking for some time away from busy lives, the villa is meant to let you breathe easy amid luscious surroundings and enjoy a restful holiday. Villa Daizo is proud to present three, well-appointed bedrooms that are located facing some of the best vistas at the villa. 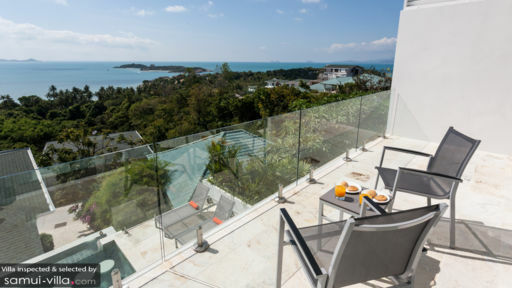 While two bedrooms sit facing the sea and neighbouring islands, the third bedroom is east-facing thus, giving you front-row access to jaw-dropping sunrises. The contemporary interiors translate into minimal, all-white décor. The bedrooms are furnished with king beds for a comfortable night’s sleep. Modern comforts include a flat-screen TV with Blu-Ray player, movie collection, and air-conditioning. Three bedrooms have ensuite bathrooms with all necessary amenities. 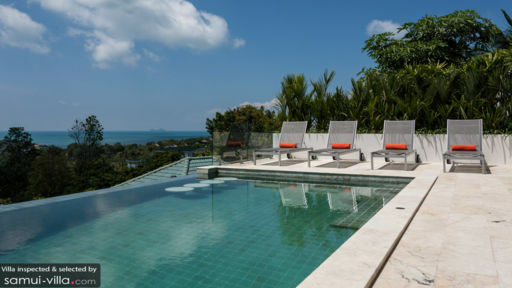 An infinity swimming pool overlooks the splendour of Samui’s coastline featuring the dazzling ocean as it glitters under a tropical sun. The islands far away peek at you from a distance to give some depth to the view. While you lounge on the sunbeds, besides watching the sunrise relish some light appetizers or a freshly-grilled BBQ set up by the staff. There is outdoor dining available to guests for a truly tropical alfresco experience. The terrace is lined with some chairs that gaze perfectly at the sun-streaked sky. Relax on the in-built stools at the pool’s edge while basking in the view. The modern living area stands adjacent to the pool deck and separated by glass doors allowing you to enjoy the panoramic view even while indoors. There are comfortable, plush couches that sit facing a tiled wall with a mounted television fitted with surround sound and free wifi. The living area has been designed with a modern style with minimal furniture, elegant furnishing, and the corners adorned with indoor plants to freshen up the space even further. Besides the alfresco dining area and the adjacent bar, there is another indoor dining area within the living room with an eight-seater dining table perfect for endless feasts from dusk till dawn. There is a breakfast bar in the fully-equipped western kitchen that has everything from a farmer’s sink to a state of the double-door refrigerator and in-built microwave/oven for the bakers amid you. Get your early morning coffee fix easily with the coffee machine in the villa kitchen. An English-speaking manager oversees the smooth functioning of the villa and can even ensure that guests have everything they need as and when they need it. The manager can make any arrangements on your behalf such as booking a car or a scooter to travel, massages, or even a private chef. These may be charged additionally. Centrally located and yet conveniently distant from the busy streets, Villa Daizo offers the best versions of both worlds. You have the beach only a couple hundred metres away and places such as Fishermans Village and the famous Chaweng with its beach bars and restaurants only a short drive away.